Nothing beats sitting down with a new book, poring over the printed word and turning crisp pages. Unfortunately, a busy life doesn't always leave time for reading. This is why I love audiobooks so much. You can listen to your book anywhere, anytime, and while you are doing almost any task. Audiobooks can make a long commute or a day of household chores much more enjoyable. The only downside with audiobooks is that they tend to be pricy. 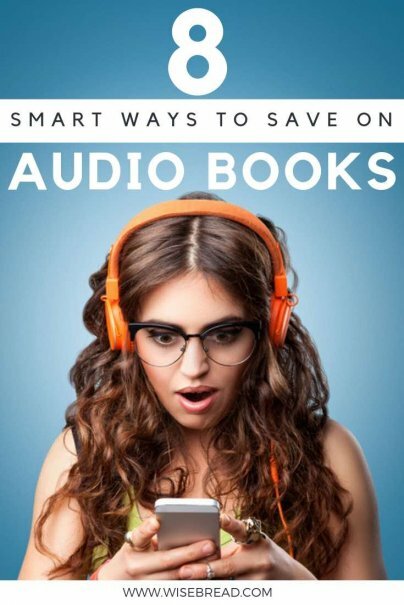 Here are my top tricks for saving money on audiobooks. If you haven't already, sign up for a free Audible trial. Most offers include a free month of Audible, which includes a free book download. Sometimes you can score three months for free. Already used your free Audible trial? Don't give up just yet. Whenever you see a free promotion going on, ask an Amazon customer service rep if they could apply it to your account. A few months back, Amazon offered three months for free to Audible. Several of the Slickdeals.net board members said that all they did was ask an Amazon customer service rep if they could be considered eligible for the promotion, and they were given the promotion, despite having done an Audible free trial in the past. I asked, too, but did not get three free months. Instead, I got a discounted membership for $7.49 a month for the first three months. It's always worth asking if there are new promotions you can take advantage of. Many libraries use Overdrive, which allows library cardholders to check out eBooks and audiobooks. The best part about using Overdrive is that you will not have to pay late fees. When your book loan expires, you just lose access to it. However, you can renew it as many times as you need to, and will gain instant access to the audiobook, unless others have it on hold. Many people might know about Overdrive, but not too many people know that each library has their own selection inside Overdrive. I am lucky enough to be a member of three different libraries, and each one can be connected to the Overdrive app on my phone. Different books are offered between the three libraries, which expands my options. Also, I can put a book on hold under each card, allowing me to get the book faster. Sometimes Amazon will offer the kindle and audible version of a book for less than just the standard $14.95 per Audible credit. Most traditionally published books have high Kindle prices, but they often regularly get discounted. For example, Fern Michael's Balancing Act is on sale for $5.99 and you can add on Audible narration for only $3.49. This means you will pay $9.48 for both, which is certainly less than the $11.95 Audible price. For $9.99, you can get unlimited access to over one million books and 1,000 audiobooks. And there are several, often overlooked, indie-published books available there, too. However, you will also find bestselling books, such as the Harry Potter series and even Water for Elephants, which allows Kindle Unlimited members the opportunity to read and listen for free. If you are unsure about the Kindle Unlimited membership, you can try it free for 30 days. Audiobooks are a great way to pass the time, whether you are stuck in traffic or have to tackle your spring cleaning to-do list. Audiobooks can also help you reach your reading goals when life is busy. Have you listened to a great audiobook lately? We want to hear about it. Once a member, sign up for Audible's mailing list, to know its Daily Deal. I've gotten some great books this way, at a fraction of the monthly cost. And while you mention Overdrive, don't forget that hoopla and OneClickDigital also have an audiobook library borrowing program. And you also should mention librivox, for your favorite public domain volunteer audio needs. And lastly, a user should invest in a quality Kindle device which has "text-to-speech". While it takes some getting used to (mispronouncing the different ways to say, "live", for example), it is a pleasant enough way to get some non-audio-books in one's daily commute. don't forget - in addition to Overdrive downloadables, your Public Library has audiobooks on the shelf. Project Gutenberg is another alternative. The chain Half Price Books has used audiobooks for around $10 on CD, and you can sell them back afterward.